We had a fantastic weekend in beautiful Melnik 30 k´s outside Prague in Czech Republic. This was the second time we performed at their yearly Vinobrani Festival, a wine festival. Last time was 2010. We really enjoyed to cruise around in this beautiful town packed wih local wine stands, great food, beer of course, heaps of people and lot´s of music. Talking about music, it was great to catch up with our old friend Nick Cash from legendary 999, we also got to see and talk to bands like Barb Wire love. 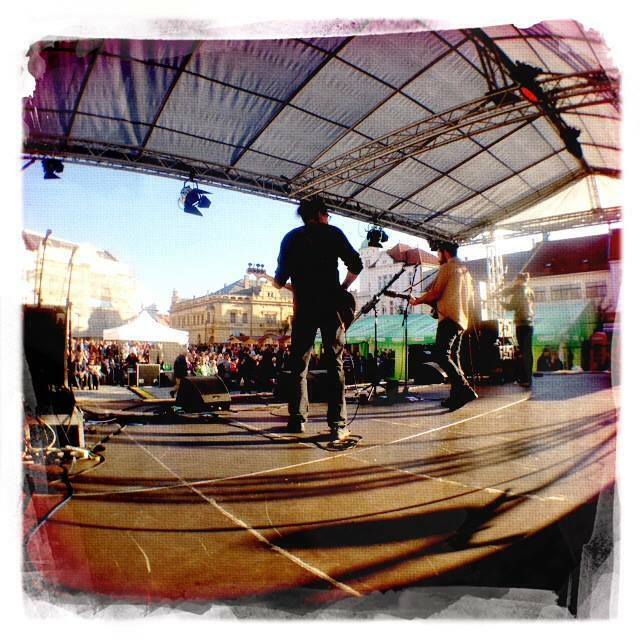 Our gig at one of the squares got really well and we got to talk to new fans and friends. After our swedish friends Sterile Hermaphrdoite finished their gig we packed up in a mini bus for transport 70 k´s north to a town called Louny. Me and Hanna decided to take a walk and have a look at the beautiful town, looked like a castle that surronded the city. Kent and Sterile entered the club GeTiToN and were all in a great mode when we got there, and so were the audience, a great fun gig. We do love Czech Republic and we will surely be back one of this days. Thank´s to everybody who came to the gigs. Thanks GeTiToN. Thank´s Petr ANK Music. Thanks Melnik!